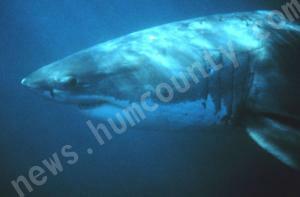 FORTUNA, Calif.â€”A man who was out with his family on his motorboat believes they may have run into and killed a great white shark that washed up in a Humboldt County beach last weekend. Chris Justice, of Fortuna, believes a thud that shook the boat during the family's Labor Day weekend outing, lifting the outboard motor from the water, may have been the shark. His wife, Mary Justice, who was closest to the engine, saw a pectoral fin and the shark's mouth, he said. Justice got a glimpse of the shark, estimating it was between 15 and 18 feet.